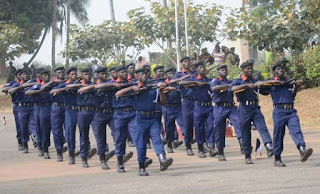 Nigeria Security and Civil Defence Corps (NSCDC) says it has suspended two of its own officers for illegally possessing petroleum products. Spokesman of the Corps, Emmanuel Okey who made this known in a statement on Thursday in Abuja, said the two officers were recently arrested and paraded in Bayelsa State. Okeh said the affected personnel are Assistant Superintendent of Corps (ASCI) Agah Utavie and Assistant Superintendent of Corps (ASCII) Angel S.K. are hereby suspended from the service until investigations are concluded in this case. He said the Commandant General of the Corps, Abdullahi Gana Muhammadu had set up a panel of inquiry to investigate the matter.